How many types of access specifiers in C#? What is Access Specifiers in C#? 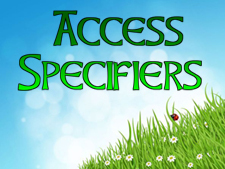 Access Specifiers defines the scope of a class member. A class member can be variable or function. In C# there are five types of access specifiers are available. In this chapter you learned what access specifiers are and how many types of access specifiers in C#. In next chapter you will learn about public access specifiers.